Within Pluto’s informally named Vega Terra region is a field of eye-catching craters that looks like a cluster of bright haloes scattered across a dark landscape. 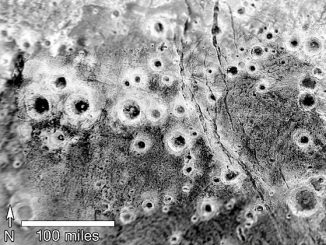 NASA’s New Horizons spacecraft has revealed that the floors and terrain between the craters show signs of water ice, but exactly why bright methane ice settles on these crater rims and walls is a mystery. 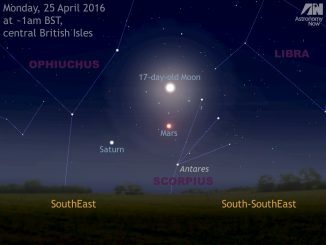 With just a month to go until the 2016 opposition of Mars, the Red Planet is now visible very low in the southeast before midnight for observers in the heart of the UK. Mars and ringed planet Saturn are presently separated by just over 7 degrees — a low power, wide-angle binocular field of view. The waning gibbous Moon passes by on the mornings of 25—26 April. 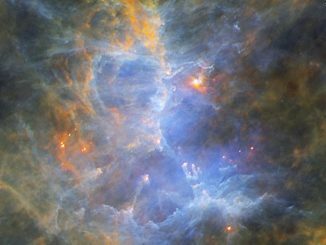 The Eagle Nebula, also known as Messier 16 (M16), as seen by ESA’s Herschel Space Observatory. A group of young, bright stars, not visible at these infrared wavelengths, are located near the centre of the image. The powerful light emitted by these stars is setting the surrounding gas ablaze, causing it to shine. 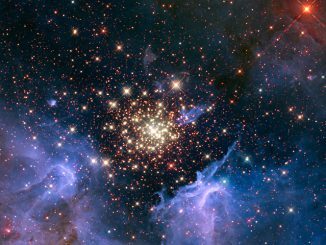 Most of the cosmic rays arriving at Earth from our galaxy come from nearby clusters of massive stars, according to new observations from NASA’s Advanced Composition Explorer (ACE) spacecraft. But the detection of a few radioactive cosmic-ray iron nuclei also indicates that there has been a supernova in our galactic neighbourhood within the last few million years. 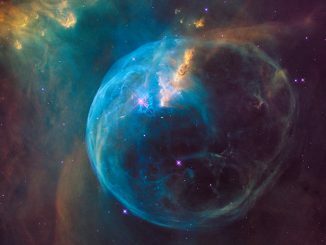 This new NASA/ESA Hubble Space Telescope image, released to celebrate Hubble’s 26th year in orbit, captures in stunning clarity an object known as the Bubble Nebula (NGC 7635) — a cloud of gas and dust illuminated by the brilliant star within it. The vivid new portrait wins the Bubble Nebula a place in the exclusive Hubble hall of fame. 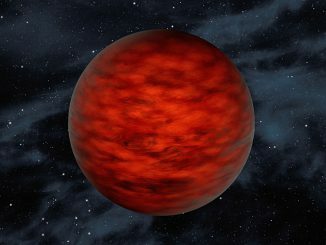 Astronomers have found a free-floating object called WISEA 1147, thought to be an exceptionally low-mass “brown dwarf,” which is a star that lacked enough mass to burn nuclear fuel and glow like a star. 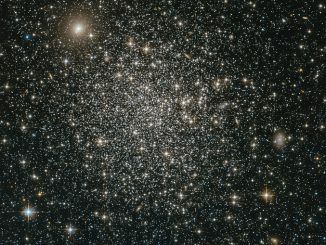 Reasearchers using data from NASA’s WISE and 2MASS sky surveys found the object in TW Hydrae — a young, 10-million-year-old association of stars. 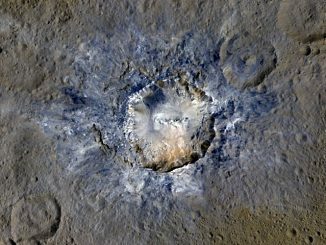 Craters with bright material on dwarf planet Ceres shine in new images from NASA’s Dawn mission taken from its lowest-altitude mapping orbit. Young crater Haulani (diameter 21 miles) and 6-mile-wide Oxo Crater — the second-brightest feature on Ceres — provide scientists with insight into the dwarf planet’s materials and surface morphology. 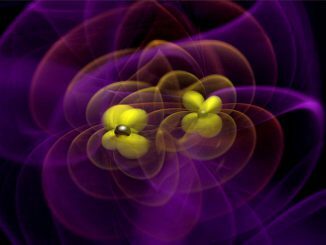 On 14 September 2015, gravitational waves produced by a pair of merging black holes gently rattled space-time in the vicinity of Earth. Less than half a second later, NASA’s Fermi Gamma-ray Space Telescope picked up a brief, weak burst of high-energy light consistent with the same part of the sky. Analysis of this burst suggests that the events are connected.